Everyone is familiar with the fact that the moon changes phases. But what many don’t know is that planets also go through phases. 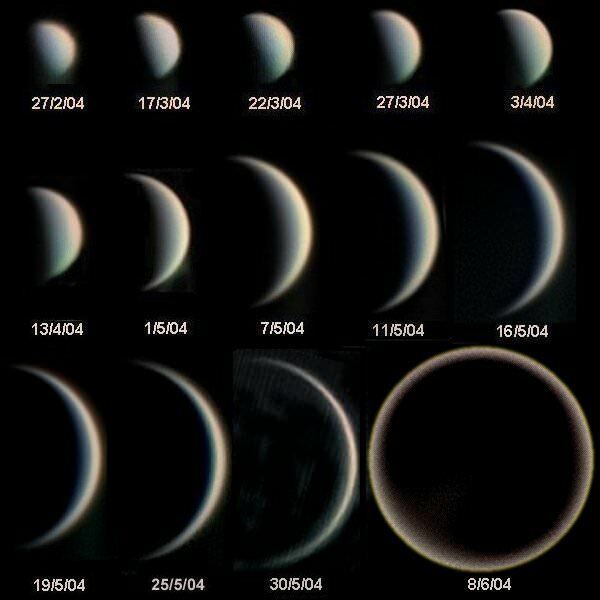 Shown above are the phases for Venus. We look inwards on Venus from a more distant vantage point in our solar system, but in principle, planets in other solar systems would also go through phases as they orbited. While we are far too distant to resolve these phases any time soon, the percentage of reflected light may give clues about the size, composition, and atmosphere of a potential planet. A new study by astronomers at the University of Bordeaux in France, analyzes differences in the way light would be reflected from various exoplanet configurations. In a previous paper by the same team, they had analyzed how much light planets at different phases should reflect in different wavelengths of light in the infrared. Planets with atmospheres showed significant lack of emission at some wavelengths while rocky planets with no atmosphere reflected most strongly at one wavelength and faded smoothly off. The heavier the atmosphere, the more pronounced this effect was. As such, the team concluded that simply by looking at the reflected light in a few wavelengths, they could quickly determine whether the planet were likely to have an atmosphere. The new paper adds to this by exploring what the effects of properties such as stellar type, orbital distance, radius of the planet, and inclination would have on these observations. They found that the presence of an atmosphere made determining many of these properties more difficult since it would be able to retain heat and reradiate it different manners instead of simply reflecting. Rocky, airless planets were simpler and the light curves could be used more directly to determine the radius of the planet with an accuracy of about 10% with an instrument such as the James Webb Space Telescope. The orbital inclination could be narrowed down to within 10°. Currently, the only way astronomers can determine this property is if the planet is in the narrow ranges of inclination that allow it to transit the star, so while observing the phases to determine this property leaves large uncertainties, it is a start at the very least. These observations could also be used to determine the albedo, or reflectivity of the planet. This property could be used to help constrain the possible chemicals on the surface or in the atmosphere. This is amazing. Now we *got* to have the JWST. Or at least The Exoplanet Characterisation Observatory (EChO), first time I heard of it. [Love their logo btw, a must see!] If I understand correctly from my hasty browsing, ideally they want to look at 1 or 2 orbits. It would take years, but they aren’t sensitive to sampling time so won’t use up one observatory’s capacity on a single planet. So they can go out ~ 10 pc I think they say, but will catch 100s of exoplanets (no need for transits) which is hopefully enough for some statistics. And they will extract the orbital inclination, which would help constrain masses for some exoplanet detection methods if I remember correctly. It must be a nice complement to today’s observations.